Bennett developed a love of water in Mexico in 2011. We clipped him into a life jacket, plopped a sun hat atop his head and he was off, splashing around the pool for what seemed like hours at a time. That summer we hit Surveyor’s Lake in Fernie for more swimming, and the following spring I enrolled him in his first group swim lesson at the Talisman Centre — he had a hard time staying on task, but we persevered. Good thing too because four years later it’s official: the boy can swim. Blake lowers Bennett into Surveyor’s Lake near Fernie. We logged a lot of hours in the water and numerous baby steps to get Bennett to where he is now (head above water). After two summers of encouragement he finally jumped from the dock at Surveyor’s Lake in 2013, and then last summer (2014) he worked up the courage to jump from the diving board into the pool at the Fernie Aquatic Centre. 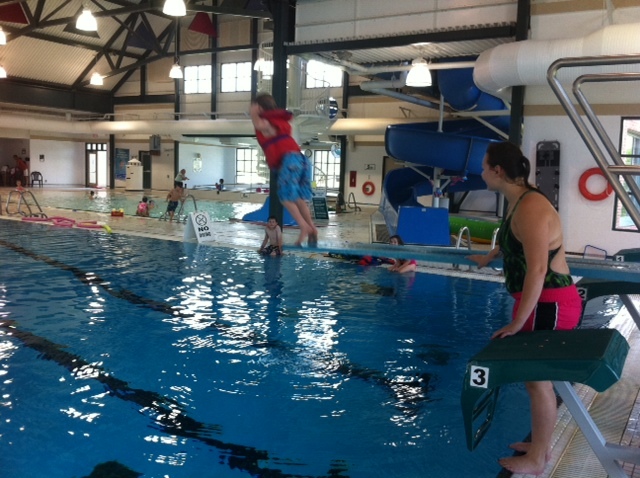 Bennett jumps into the deep end at the Fernie Aquatic Centre, the culmination of a week of private swim lessons. 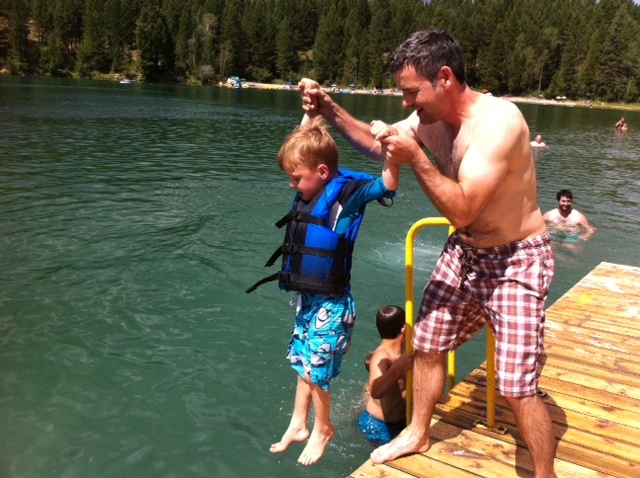 Also last summer, after a week of life-jacket and noodle-assisted swim lessons, Blake encouraged him to try and doggie paddle at Surveyor’s Lake, and again at Kalamalka Lake in Vernon, BC. For the first time, Bennett seemed to want to swim on his own. He tried to kick and paddle and propel himself forward in water. There was hope it would all click and we could retire the life jacket for good. 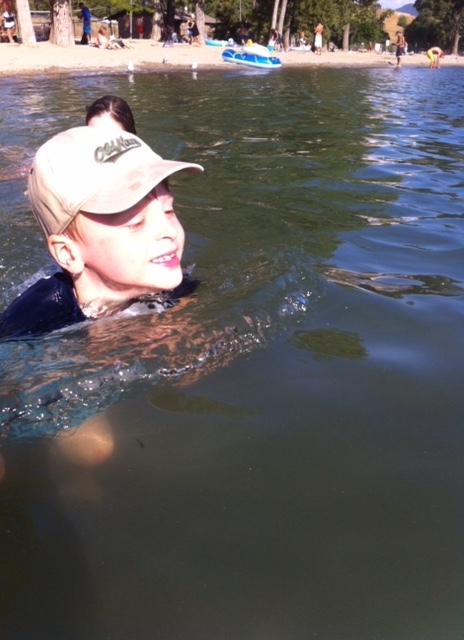 Bennett attempts to swim at Kalamalka Lake in Vernon, summer 2014. When you have a child with special needs it’s hard to know when they’ll reach certain milestones. With Avery, a “typical” kid, everything happened pretty much on schedule, from walking to talking to potty training (age almost 3) to riding a bike (age 4) and swimming (doggy paddle at age 5). To prove he’s very much on his own schedule, Bennett walked at 19 months, talked at age 3, mastered the toilet at 4, and still can’t ride a two-wheel bike. But we have expectations that he’ll eventually get there. That’s part of the reason we keep trying. So when Bennett, now 7, began doggie paddling across the hot tub in Fernie in January, Blake figured he was ready to swim without flotation assistance. He marched Bennett into the pool, they swam to the deep end, Blake let him go, and — just like that — Bennett swam to the ladder by himself. It was like all those hours spent in the water with us and with instructors (who at times I’m sure thought he was a lost cause as he stared off into space), finally paid off. Swimming? Check! Bennett swims across the deep end at the pool in Fernie. Yes, Bennett’s is a rather sketchy doggie paddle, and I’m frightened his head will go under at any moment, but the boy kicks his legs and flails his arms and gets across the pool without inhaling its contents. I’ll take it. He may never master the butterfly or even the front crawl, but as long as he can manoeuvre in water without drowning, I’m thrilled. And so very proud. My water baby has finally shed his water wings. Way to go, Bennett! 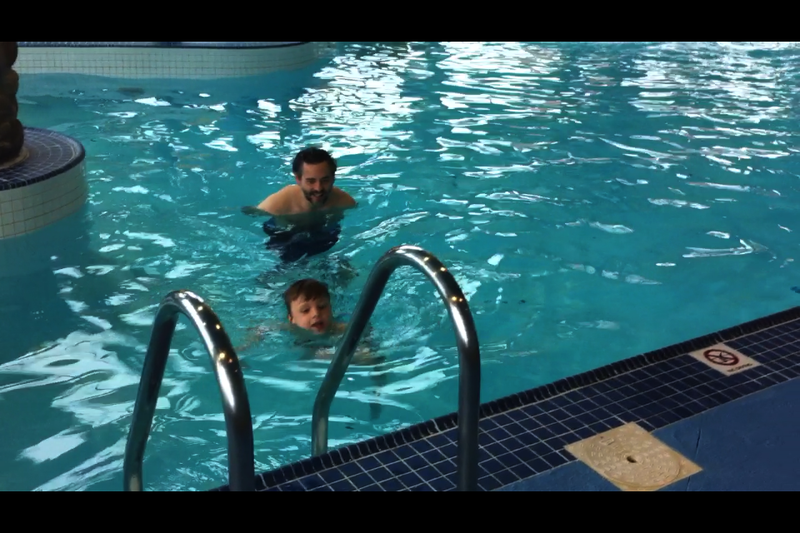 This entry was posted in Parenting and tagged autism, autism and learning to swim, swimming with autism. Bookmark the permalink.